Our theme will be: "We're In This Together - You Don't Have to Walk This Journey Alone". We will have tracks for young women, survivors and supporters. We will have several guest speakers and a round table discussion comprised of breast cancer specialists and clinicians. If you thought the past events were inspiring and uplifting...you don't want to miss our 2018 Retreat! 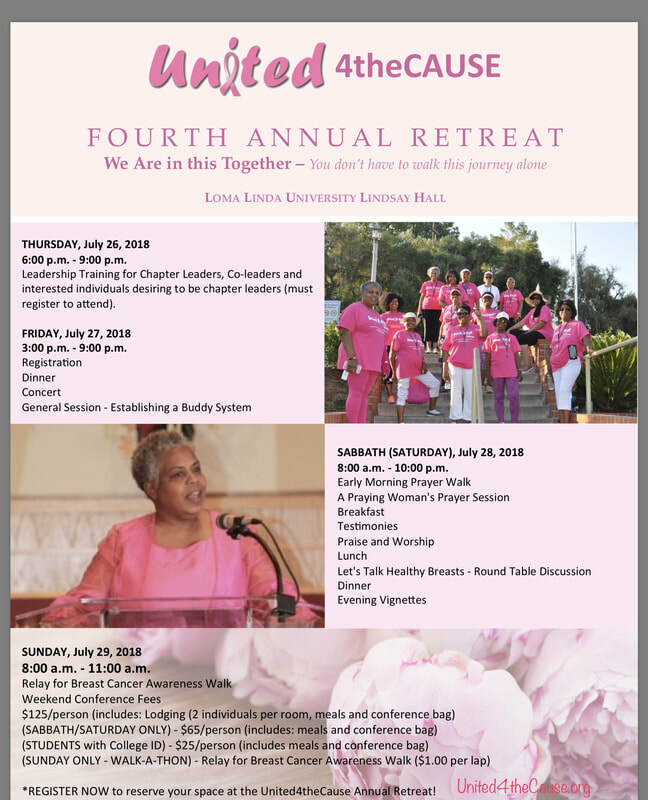 ​General Retreat Activities will include: welcome/plenary session, sharing testimonies, praising God through song and the Word, a Relay for Breast Cancer Awareness Walk, and empowering one another through fellowship. ​ You will find a sneak preview of the program outline on the registration page. A formal program outline will be provided upon registration. Follow the links below to register. You don't want to miss out on this awesome experience to retreat with Christian Sisters! ​1. Click here to register for the 4th Annual Retreat.